For what it's worth, my opinion of the Q+AL version of IWBTLY is that it's an absolute joy! Why this is not a staple of the live set is beyond me, even Brian's take on the solo is exceptional. Please play this song in the up and coming European shows, it would go down a storm I personally would love to here more songs played by Q+AL that Freddie never got to perform, Breakthru, Headlong, Scandal and You Don't Fool Me to name but a few. I love their version of IWBTLY, too. Are you planning to attend a show this summer? Unfortunately not, I went to Birmingham (Twice), Nottingham and Wembley last year. I really was hoping for a big outdoor show in London this year, I'm convinced they could've sold out Wembley or the Olympic Stadium but for what ever reason they chose to do 3 indoor shows. I hope I'm proven wrong but the set list will not change either, I understand it's a huge production but they really do need to start to change things up now, each show on this next leg of the tour should have at least one curve ball thrown in........something like IWBTLY or Headlong or even Ghost Town would just be amazing and add interest to a static set list. They are now playing to repeat markets with the same stage show and probably a lot of returning fans, they need to freshen thing up. 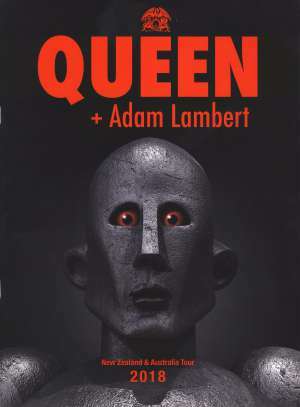 Open with WWRY then Headlong!, drop the drum solo, change Freddie's sing along to Montreal or Milton Keynes, play a song they've never done before, Made In Heaven for example....something to get people excited about this leg of the tour. Completely agree, however, most of the up coming European dates are shows in places they didn't get to last time. I think it's unlikely that they'll change things for only four UK shows. . . . It would be great if they did though. Apologies if this is common knowledge around here, but what are all these figures meant to represent? agkelly wrote: Apologies if this is common knowledge around here, but what are all these figures meant to represent? I didn’t think Adam is considered a celebrity by Hollywood standards but the cool pic of him pedaling around Perth is in the current issue of Star magazine which I unknowingly purchased at the grocery store yesterday. I know I'm a bit too late but - wouldn't any of you guys be willing to sell me the Australian version of the 2018 Q+AL tour programme? I cannot find it anywhere and it's missing in my collection. I'm willing to pay a double or even triple of the original price. Please PM me if you can help. I've been scanning ebay for months and everybody sells just the generic EU version. Sorry, Mr.Scully. I have it, but I'm not willing to part with it! I think, from memory, it's pretty much exactly the same as the North American 2017 tour programme. I'll compare them and will let you know.